If you liked this article, then please subscribe to our YouTube Channel for WordPress video tutorials. You can also catch us on Twitter and Google+. How do I maintain the graphics that comes with a theme? Themes will look very beautiful on vendor’s site but after installation, it’ll be looking boring. I’m sure there’s something I’m not doing correctly. Thankyou. Unfortunately (i wont mention the website), dosent actually show you how to install the themes properly. They give you a brief look over, but not actually how to do it step by step. Sometimes, its what you need, thanks again. Hi, I uploaded a new theme and activated it. But i am unable to visit the particular site. One default theme is showing. Why? How can i visit the site which i uploaded? So I just followed these instructions to add a theme and after the theme uploaded successfully and I clicked “Activate”, I received a Parse error. How do I now undo this issue? Thanks! You can undo this by connecting to your website using FTP or File Manager in cPanel dashboard. Once connected, go to wp-content/themes/ folder and delete the theme you were trying to install. I have dowloaded the Pro version of my basic free wordpress theme because the Pro version unlocks more features for colours and design. In my free theme it said : Go Pro. So that’s what I want to do. However when I upload the pro version through WP theme installer, it says installation failed because there is already a folder with that name. Do you think the Pro zip file has the same name as the free basic version? What should I do? Use an other theme for a few minutes and de-install the free basic theme first? And then install the pro zip file? I’m unsure what to do. And will deinstalling it from my wordpress theme collection also deinstall it from my host server? You would want to first reach out to the theme’s support to ensure they do not have a recommended method to change to the pro version as it could have the same name. I found a new theme that I have downloaded and subsequently installed onto my WordPress site for under Add Themes> upload theme. I want to activate it and move no contents from the existing site. I intend to have it the way it is. Any advice? What could be wrong? And how can I rectify it? Please follow the instructions in our guide on how to fix WordPress memory exhaustion error. Hi, I am having issues here.. I have followed all this site’s steps to get my website on wordpress.org. I have a domain I bought a while ago, transferred it and have it successfully hosted now on BlueHost. I just purchased a WordPress premium theme for $125 (which is p expensive..) and I can’t get the .zip file anywhere.. Also, it auto installed onto the example.WORDPRESS sites instead of my wordpress.org Bluehosted nerdvegan.com and I have no idea how to switch it since there is nowhere to download the .zip file. Also, having multiple sites listed in and of itself is messing me up, how do I get rid of everything but just the example.com that is on wordpress.org? please help!~ thank you in advance!! 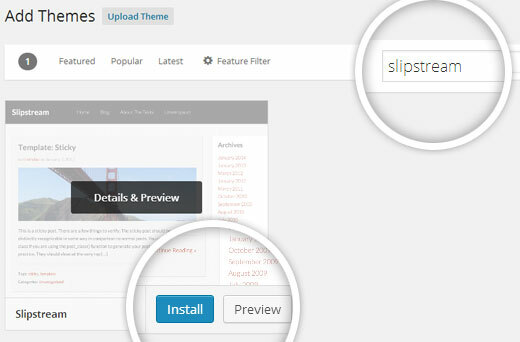 Please contact the theme shop you purchased the theme from to help you find the ZIP file you need to install. Once you are certain that you have the theme’s zip file on your computer. 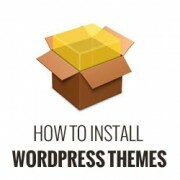 Go a head and login to your WordPress website where you want to install the theme. 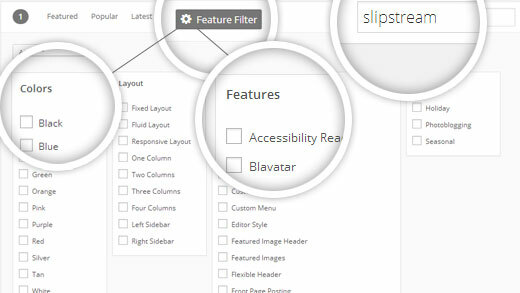 Go to the Appearance » Themes page and then click on the Add New button. Next, you need to click on the upload button to upload the theme file from your computer. Please see the screenshots in the article above. I am on WordPress right now and there is no button to add a theme as the screenshots show. Did their pricing models change? Does it require a premium version now to be able to do this? hi i tried using all the options but still installation of new theme fails, what might the problem be??? 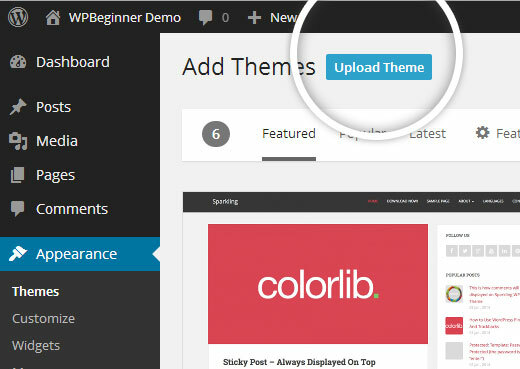 I am using a free plan wordpress theme. And i have download a new theme I liked. When I tried to install the new, there was no upload button. How can I install the new one? It looks like you are using WordPress.com. Please see our guide on the difference between WordPress.come and WordPress.org. I just purchase my premium plan with my domain name and storage space (that whole package). When going to appearance>themes, there is no add new button? Recommendations? Are you sure you are using self hosted WordPress.org? Please see our guide on the difference between self hosted WordPress.org vs free WordPress.com blog. Hi I don’t find the add new button what you suggest to do? Thanks for the article. I have a few questions as I’m a bit confused. I already have a live website hosted by Inmotion hosting. I wanted to change the design so I found a theme on Envato by Themeforest, the provider was Themezaa – and I bought the theme I liked. It was a wordpress theme. After I bought, I realised I don’t know the difference between a normal theme and a wordpress theme. I found out that I can only use this wordpress theme I bought from a wordpress editor – which is fine by me as I’m not a coder (I only received a 3 month online course on html and css circuits) so I know a bit about editing html and css. 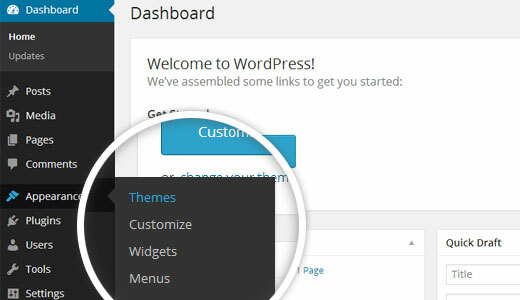 Now that I bought the wordpress theme, I’m thinking, can I simply download the wordpress editor, keep my existing host (inmotion hosting), install this new theme, edit the contents and colors and then when I’m done simply connect my domain to my new website? Is this how I’m suppose to do it? or do I need to cancel my existing host, and start paying wordpress.com to host my website as I’m using their editor? Can you please let me know how this works? First, please see our guide on the difference between self hosted WordPress.org vs free WordPress.com blog. Your theme would only work with self-hosted WordPress.org site. Having said that, follow the instructions in our step by step WordPress installation tutorial to get started with WordPress. I also I found a theme on Envato by Themeforest that I have downloaded and subsequently tried to upload onto my WordPress site for under Add Themes> upload theme and it does not want to install. It just says: “Error: fail to upload.” Any advice? I then went to load it through the C-Panel- I loaded the Zip file, unzipped it and went to my dashboard. The theme box comes up empty, I pressed activate and the theme shows up only as HTML. Please see your theme’s installation instructions. Some theme developers on themeforest actually send you package which has documentation, PSD files, and theme itself is a separate zip file inside the main folder. If you don’t have the domain name or hosting still can you make the website on WordPress? After finishing the design can we buy the hosting and domain? Is it possible? It doesn’t matter what one believes they know. Or .. How much of whatever it may be they THINK they know. With an open mind to receive an understanding. One may even amaze themselves of how easy life can be. WP Beginners for simplest advice for installing my “purchased” theme. I have clicked in appearance>theme. But i didn’t found add new button. Please help me sir. Make new and updated article. Go to theme and then upload a theme then you will see add new theme. Thank you a bunch! All articles thatI have read and video tutorials I have watched here really helped me a lot. Congratulations to all the people behind this. It’s really amazingly helpful. How long does it usually take to down load your theme? I’m importing demo data & it’s been 4 hours. I’m thinking something is wrong. Please contact your WordPress theme developer. There is something wrong. I bought some themes from themeforest and they are all 60 to 90 mb in size. It took me about 20 minutes to download them. So i think that the 4 hours download (which still did not completes), there is something wrong. You should contact the website admin from where you are downloading the theme. Do I need to be a Premium User to upload a theme? No. Not if you are using the self hosted WordPress.org. Please see our guide on the difference between self hosted WordPress.org vs free WordPress.com blog. There is no button for me to press to upload a theme, what should I do? anyone know how can i tackle it??? Hey, I get the same message, were you able to fix this already? Help will be appreciated. how can i download theme from my website . Connect to your website using an FTP Client. Go to wp-content > themes folder. Select your theme and then download it to your computer. Can anyone tell me why, when I navigate to Appearance > Themes, I don’t have an ‘Add New’ button? It’s very frustrating! “Are you sure you want to do that? theres no ADD NEW button. different with the WP before. or it’s cause of I use the WPMU? Pls, I dont get to see the add new tab on my own dashboard pls. What am I doing wrong? Not even the plugins tabs too. You may be using WordPress.com. Please see our guide on the difference between self hosted WordPress.org vs free WordPress.com blog. Seems like you have bought a child theme for Genesis framework. You will need to install Genesis too. The infographic and guide article doesn’t tell me anything. Where is the stupid “Add New” button? Thanks for the help installing the premium theme, I needed that! Same exact problem as above visitors Allison Taylor and Felix…. There is NO “Add New” button on the WP Dashboard Screen at all! Can we get some help on that, please?? All my apologies for that! So newbie on WP installing platforms that I did not realize I had a .COM Dashboard instead of a .ORG Dashboard… Anyway, it seems that I had first to install the new WP 4.2 version, and after downloading the pack in my computer, there was no zip file to open and install anything… So, my problem remains… I cannot even believe when reading from WP: “the famous and easy 5 min installation”. It is more like 5 hours to me. Please see our guide on the difference between WordPress.com vs WordPress.org. Hi, I do have installed wordpress.org to my domain… still I don’t have the “Add new” button… what am I doing wrong? It is possible that your domain may still be pointing to WordPress.com. You need to point it to your new web host. Can anyone tell me why I keep getting download failed messages every time I attempt to install a theme from the themes directory? I also get error message when I try to update the plugins. …….. though I would like to set up a website not a blog, a place for information & room to keep adding information in the future, with possibility to ask questions if someone desires to do so, I don’t think a blog would do for that. Can you help me. Should the new uploaded theme look exactly like the screenshots in the advert? No not necessarily. 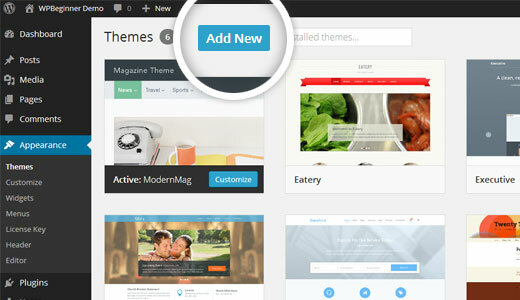 In order to show you all the features of a theme, the demo would have additional content or images. When you download and install the theme on your site that content does not come with the theme. So your theme may not look exactly the same. I do not have the “Add New” button on my Theme dashboard, what now? Hello I have the same problem of Alison, I don’t have any “add new” button in the theme page. Is it just for the premium ? if not how could I fix that ? Are you sure you are using self hosted WordPress and not WordPress.com. Please see our guide on the difference between WordPress.com and WordPress.org. I am really impressed with your post. You shared good post about wordpress theme. Your post is really nice and helpful to all newbie wordpress developers. Thanks to share useful post with us.